The Big Takeaway: HHH made his first Raw appearance since August 29, supposedly to accept the many times Seth Rollins had challenged him for a fight. HHH did a long promo before he told Rollins to come out, but as Rollins came to the ring, Samoa Joe made his long-awaited WWE debut, attacking Rollins and choking him out with the Kokina Clutch. Kevin Owens defended the Universal Championship against Braun Strowman, which ended when Roman Reigns did a run-in laying out both men. Brock Lesnar, through his mouthpiece Paul Heyman, challenged Goldberg to one final match at WrestleMania. Goldberg will appear next week in Portland for a rebuttal. Owens and Jericho started the show. Owens showed up with a heavy limp selling his injuries from last night. He also had the emblem of Quebec wrapped around his arm, as did Sami Zayn later, in a show of solidarity after the shooting at a Quebec mosque last night. Owens said he proved Mick Foley wrong when he defeated Reigns last night. He said all Foley has tried to do from day one is prove him wrong, but he said he was the man, he was the guy, he was the one. Owens was man enough to admit he had some help and he wanted to take the opportunity to thank the man who helped him. He teased Braun Strowman, but he thanked Jericho and the two hugged. Owens put over Jericho, saying Jericho was the greatest Royal Rumble competitor of all time. Jericho talked about lasting 4 hours, 56 mintues and 12 seconds in cumulative time he's lasted in the Royal Rumbles he's competed in. He talked about lasting an hour and 1 minute, and proclaimed himself the "61 minute man." He put over #61minuteman, then told the fans to hastag #greatestofalltime. He claimed the only reason he didn't win was because of a case of vertigo he suffered while hanging from the cage during Owens' match. Strowman came out. There were audbile "Thank you Strowman" chants. Strowman said he did what he did last night because of two things; he doesn't like Reigns and he wanted the Universal Championship title shot that Owens promised him. Owens acted like he didn't know what he was taking about, but Strowman showed a videotape of Owens promised him a title shot if he helped him. 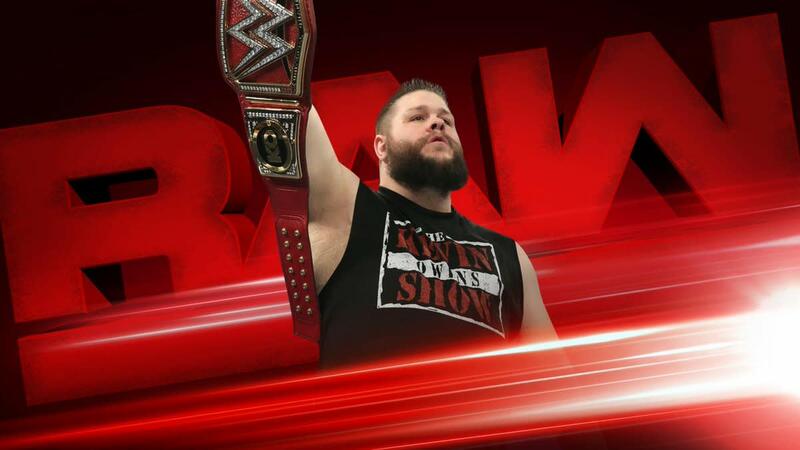 Strowman wanted his title shot tonight or he would break Owens in half. Foley walked out in a checkerboard green-and-black suit. Foley said he didn't like what Strowman did last night but now that he's seen the footage, he understands. Jericho claimed the videotape was CGI. Owens said he couldn't put the title on the line tonight after going through hell last night against Reigns. But Foley said Owens may have to go through hell again tonight because he will face Strowman for the championship tonight. Jericho pulled out the Huracanrana off the top rope, then further back into the 90s for the spot where he tried to cover his opponent with a single foot over his chest. That led to Zayn's comeback with a Blue Thunder bomb, then teased the Helluva kick, but Jericho rolled out of the ring. Zayn then teased the fly between the ropes DDT outside the ring, but Jericho rolled away. Zayn hit the Tornado DDT and went for the Helluva Kick, but Jericho got a schoolboy cradle and turned it into the Walls of Jericho, but Zayn got to the ropes. Zayn got up and used the Exploder into the turnbuckle, then pinned Jericho with the Helluva Kick. Sheamus and Cesaro argued backstage when Bayley stepped in. They're in a six-man mixed tag vs. Anderson, Gallows and Charlotte tonight. She asked for a group hug. Sheamus put his arms down while the other two hugged. Anderson, Gallows and Charlotte walked in. Anderson said they've stumbled on the Royal Rumble support group. Gallows leaned down and called "Bayley" nerd, straight out of the movie "Revenge of the Nerds." The heels laughed and walked away. Stephanie McMahon will confront Seth Rollins tonight. They had a great highlight package with Rollins calling out HHH from NXT Takeover: San Antonio on Saturday night. Owens walked in to talk with Stephanie upset about having to defend his championship tonight. He said he's injured. Stephanie admitted it was unfair that he had to defend the championship tonight and as soon as she finishes with the Rollins' business, she'll talk with Foley tonight. Mustafa Ali hit a neckbreaker and teased the inverted 450, but Nese took his legs out from under him and Ali took a bump on his neck off the top rope. Nese got the pin with a running knee to the face in the corner. Austin Aries did an interview with Nese where he threw some questions like he was Stuttering John from 1990s Howard Stern, like "People say you have washboard abs. How do you respond to those who say that a washboard is more interesting?" Nese said "The Supreme Athlete doesn't have to respond to his critics." Rollins came out and called down Stephanie, who walked out after being called "The Billion Dollar Princess." Stephanie said she out to disappoint him on multiple levels. Seth shot back "Like you do with your husband every night?" Stephanie said HHH wasn't here tonight. Seth said then he really doesn't care because all he cares about is her coward of a husband so when will she let him off his leash. Stephanie said HHH was afraid, he was afraid what he might do to Rollins. He might find that dark place inside of him that leads to him destroying him. He was afraid he might destroy what he once thought was his greatest creation. She wondered when the last time he saw championship gold. She said Rollins was on the right track after winning the championship at WrestleMania, then wasted it all. She said Rollins should beg for forgiveness and demanded he apologize. He apologized for exposing HHH as the gutless snake he really is for the last two months. He went to NXT on Saturday night, but HHH had security do his dirty work. That wasn't HHH, that wasn't the cerebral assassian, that was a scared dude. Rollins said HHH was scared because he was the greatest threat to HHH's legacy he's ever seen. HHH knows it and Stephanie knows it. Stephanie says she looks at Rollins with disgust. HHH was a creator was Rollins was an architect, but he was going to be the architect of his own demise. Rollins said he had nothing left to lose and threatened to show up at WWE headquarters, at board meetings, or even show up at HHH's house and ran into one of their daughters. It won't end until he gets his hands on HHH and he slays the king. Stephanie started to leave and said she lied. She said HHH was on his way to the building and she was coming for him. Stephanie left to her music and they teased a confrontation for later tonight. Cesaro wore streamers on his wrists. Sheamus looked at him like he couldn't believe his eyes. When the Bayley Buddies rose during the ring entrance, Sheamus looked ready to bolt. They put over that Charlotte is now 16-0 on PPV, the first superstar to do that in title matches on PPV. Charlotte interrupted Sheamus' 10 Beats of the Bodhran by slapping Sheamus in the back. After all six got in the ring, Cesaro tried a running plancha, lost his balance on the top rope, but recovered to deliver the spot. Bayley pinned Charlotte with a Bayley-to-belly suplex. Stephanie lit into Foley for arranging a title match between Owens and Strowman. Foley brought up HHH's music during Rollins match with Zayn last week. He wanted to know why that was. Stephanie hemmed and hawed about the production team going into business for themselves. Foley admitted he looked stupid, but he wasn't stupid. Stephanie, in a more honest tone of voice, said she vowed HHH would be there tonight. Foley said he was going ahead with the match with Owens vs. Strowman, unless HHH's music goes off again by accident. He asked for a High-five, but she just glared at him until he walked off. Neville came out and said last night was a true coronation of the King of the Cruiserweights. This championship was now his and 205 Live belongs to the king. He not only won the championship last night, he proved every one of the sniveling pesants wrong. The fans never believed in him, cared about him but look at him now. Rich Swann came out and said as much as it pains him to see Neville with the Cruiserweight championship, he'll wait for his opportunity because he has a rematch coming. He came out because he was tired of hearing the garbage he was spewing. Swann admitted that Neville was one of the very best and he proved it last night. Swann extended his hand for a handshake. Neville asked "When are you going to get it, Rich? You don't simply offer your hand to your king. You bend your knee and you bow." Swann just turned his back on Neville, who tried to jump him. Swann gave him a Thesz Press and a Rich Kick, followed by a tope where Swann got his foot caught on the ropes but he caught Neville anyway, fortunately. Not heat at all for this segment. Sasha Banks received tape on her injured left knee from a trainer. Bayley walked in. Banks said she was wrestling Nia Jax tonight. Bayley tried to talk her out of it. Banks said she had everything to prove and, unlike some people, she's not OK with coming up short. So Banks played gallant babyface while also throwing some heel shade at her best friend. Owens was backstage. Jericho said he talked with Foley and said the match with Strowman was still on. Jericho said no matter what, they were still the U.S. Champion. Owens said he was sick of Foley and Strowman eliminated seven guys last night in the Royal Rumble. Owens asked for Jericho's help tonight because he can't do this by himself tonight. Jericho brought up how Owens wasn't there when he lost to Zayn earlier tonight. Owens pressed him for an answer if he had his back tonight, and Jericho finally said yes, even though he looked uncomfortable. Jericho was on commentary when Strowman came out. Strowman saw Jericho, gave him a big boot as he was getting comfortable in the chair, then chokeslammed him through the commentator's table. Jericho had to be helped to the back as Owens watched on from the ring in horror. Strowman gave Owens several running bodyblocks, including one into the barricade. Strowman missed a charge at Owens outside the ring and hit the ringpost. Owens followed with a cannonball. As Strowman rolled back in the ring, Owens caught a somersaul legdrop, a senton and a Bullfrog splash for a near fall. Owens still sold his ribs from the Reigns' match. Owens went back to the top rope but Strowman caught him and gave him an Oklahoma Stampede. At this point, Roman Reigns walked out and gave Strowman a Superman Punch. Strowman didn't go down, but Reigns clotheslined him over the top rope. Strowman landed on his feet, but Reigns jumped off the ring steps for another Superman punch that Strowman stayed on his feet for. Finally, Reigns gave Strowman a spear to take him out. Reigns speared Owens in the ring to end the segment, but he still got booed. Strowman was back on his feet before Reigns could get to the back, making him out to be a monster heel who took some of Reigns' best shots and it barely registered. A van pulled up in the parking lot. A very pissed looking Brock Lesnar and Paul Heyman got out. Lesna and Heyman came out. He got "Suplex City" chants. As Heyman started his interview, the fans chanted for Goldberg. Heyman said they were at a point in history where they face a disturbing fact. They were at a point where every superstar reaches a point where they can't beat one person. The one person that they run into as saying they beat everyone, and someone else says "Yeah, but." He brought up Andre the Giant being undefeated for 15 years, and people said "Yeah, but he lost to Hulk Hogan at WrestleMania 3." He said Ronda Rousey destroyed everything in her path, and people said "yeah, but she ran into Holly Holm." The Undertaker went undefeated at WrestleMania, and people went "Yeah, but then came Brock Lesnar." Now, when Heyman goes to his kids to remind them he's the advocate for Lesnar, they say "Yeah, but Goldberg beat him in 1:26 at the Survivor Series." Heyman walked down the streets today and said that people told them about Goldberg eliminating Lesnar at the Royal Rumble. Heyman said he hates yeah, but. It's the worst thing you can say to someone who lives based on their accomplishments. That's why yeah, but must be eliminated, eradicated, killed. Which is why Lesnar is now challenging Goldberg for one final time at WrestleMania (yes, both men pointed at the sign). Heyman said one legend stands over the other. One conqurer stands over the vanquished victim. Any reading of the chapter and verse of the Bibilcal story of Lesnar-Goldberg tells you that Goldberg is the favorite. To which Lesnar says: yeah, but. Top notch promo by Heyman to start the build for WrestleMania. Jax stopped Banks during a baseball slide attempt, dragged her out of the ring, put her in a full nelson and rag dolled her into the post twice. Michael Cole for the match to be stopped as Jax dropped all her weight onto Banks' legs. Jax put her in a knee bar. The bell just sounded for no reason. Banks didn't tap out. The referee looked confused, then called for the bell several seconds after it had already rang. The crowd booed all of this. Jax then clamped the kneebar back on. Bayley came out for the save as Jax glared at her and left. Banks was helped into the trainer's room by Bayley and a trainer. Announcers played this up like it was the blow-off to the program. Lana now introduces her husband as "Handsom Rusev." Big Cass and Enzo Amore did their routine. Cass made fun of Jinder Mahal's physique, which was interesting. Cass wondered if those were veins on his body, and Enzo started singing "You're so vain." That song was #1 on the charts when Richard Nixon was sworn in for his second term. Amore asked if that was a windshield over Rusev's face (referring to the noseguard on his face). Amore tried a tope, but Mahal and Rusev caught and dropped him across the barricade. The heels double-teamed Cass, including throwing him into the dasherboards several times. They threw Amore in the ring for more double-teaming. Cass made the comeback as Amore was being pounded. Cass threw Mahal over the top rope, then slammed Rusev and laid in the Empire Elbow for two. Crowd chanted for Enzo, who tripped Mahal. Jinder ran at Enzo, who got out of the way and Mahal hit the steps. Enzo tripped Rusev, and Cass hit the big boot. Enzo pinned Rusev after Bada Boom Shakalaka. They showed portions of a documentary that will air later tonight from last year's WrestleMania in Dallas. They actually aired Charlotte hanging out with her father in tears, saying her win wasn't for her father, but her brother Reid. HHH got out of a limousine in the back. Goldberg will be back on Raw next week in Portland. HHH walked out to his "Bow Down to the King" music. He's introduced as the COO of WWE. HHH said Seth Rollins was the man he plucked from obscurity and made him a champion. He went on to become the leader of the Shield and, standing by HHH side, he would become WWE champion. Standing by his side, Rollins would get everything he wanted out of this business. All he had to do was stay by his side and he would keep getting what he wanted. But Seth couldn't handle the pressure and he collapsed. Seven months later, Rollins was an abject failure. But Rollins didn't take the responsibility for his failure. Seth thought HHH owed him an apology, but HHH wasn't going to apologize. HHH said no one wants to believe how hard it is to ignore Rollins' calls for him to come to the ring. He doesn't go to the ring because his wife tells him not to. No matter how much people don't believe it, he doesn't want to be the man who destoys careers, destroying people and doesn't give a crap about what other people believe. He wants to be a creator in NXT, trying to create the next Seth Freakin' Rollins. Now, he's done trying. HHH got people chanting for him after this promo. He challenged Rollins to come to the ring and meet his destroyer. As Rollins stalked down to the ring, Samoa Joe popped out of the crowd and jumped Rollins.He threw Rollins into the dasher boards three times as the crowd chanted "Joe." HHH watched this and walked away. Crowd started chanting "Joe is gonna kill you" as Joe dropped three sentons. Joe said "You belong to me now" as Joe put on the Kokina Clutch. Joe continued to hang on to the hold after Rollins had passed out, then finally let go. Crowd chanted "Joe."